Image: Courtesy of Meredith Goldberg. Design: Ashley Britton/SheKnows. I sat in the waiting room of the tattoo parlor thumbing through the various artists’ books while my sketch was being printed out. My best friend sat beside me looking for potential artists for her tattoo — her sixth. This was my first. We were both almost 40. It wasn’t until I was just about seven years out of having been diagnosed with breast cancer that I finally had an answer. “Is this a Breaking Bad tribute tattoo?” the artist joked as he shaved and disinfected the inside of my right forearm. I laughed nervously and shook my head. The design of my tattoo is simple. straight, clean lines, black ink. There is no message of inspiration, no tribal meaning, no flowery coloring. If you were a scientist, you would know right away what it was, but for everyone else, it did look like a tribute to the AMC show. 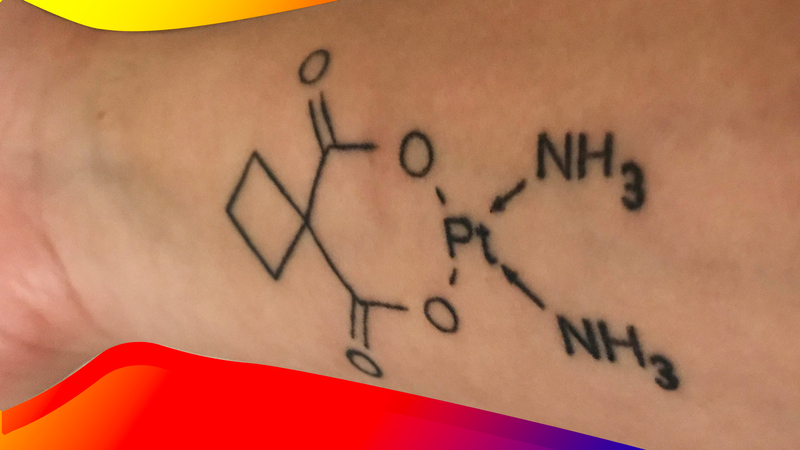 “This is the chemical compound for one of the chemotherapy drugs I was given when I had breast cancer,” I explained as he permanently etched the symbols for oxygen and ammonia into my skin, the combination equating one of the strongest drugs that I had been administered. As he followed the lines, I told my story. I was diagnosed with breast cancer, had a mastectomy and then underwent 12 rounds of chemotherapy and eight weeks of radiation. As we compared life stories, I realized that not only would my right forearm be a constant reminder of 2011 and 2012, but I would be retelling this story for the rest of my life to strangers when they see my arm. I had become so used to living with my past that I didn’t even think others would be inquisitive about what this drawing represented. “Huh?” I asked, genuinely confused until he pointed to my forearm. As I explained the significance, he looked at me quizzically, growing visibly uncomfortable with the conversation content and then quickly changed the subject. As our meeting turned back to marketing strategies for the summer, I had a wave of self-doubt; had I made the mistake that I had avoided for all these years? Was that the face I would see any time someone asked what my tattoo represented? I sat with my self-doubt for a moment, let the feeling sink in, took a breath and realized that I really didn’t care. Let friends, family, coworkers and strangers look at me strangely. Let them ask me why I’d chosen that design over and over, because my answer will always be the same. I choose to remember my illness. I choose to pay tribute to it in this way because I want to be reminded of the days when I felt defeated, the days I was too tired to move from my bed to my couch, the days when I’d look at my body in the mirror and not recognize the reflection. I lived to tell my story, so please, everyone, ask away.